I'm having such a good time with my iPhone that I thought I should be posting a photo a day. As I usually fall by the wayside when I think I can blog daily, I hope I'm not just setting myself up to fail. Today's photo started with a PaperCamera shot inside the foyer of a Philip Stark apartment building in inner Sydney. The building has been a newspaper printers in an earlier life and the foyer walls have huge photographic images of the original building. 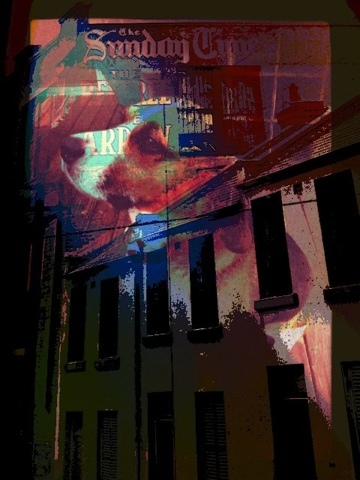 I blended this with a photo of Basil Beagle (using Photo Blender) and this is the result. I think it adds an intellectual touch to Basil. Please leave a comment if you like this and think I should do more app posts. Thanks Amanda, I'm having such a good time experimenting with them. This app is new to me too - and I like what it does - you keep sending me off to the app store; so I'm happy for you to post as often as you can! Fiona, I like this one too. I'm learning a lot as I go. I like it very, very much! I must admit it took me a while to find Basil (but sometimes the obvious totally gets past me, so think nothing of it). I would like to see more along these lines - so much fun to see what we can do with our phone photos! Like Amanda and Fiona, I had not heard of this app before, but now will probably get it. Judy, maybe I should turn it into a jigsaw puzzle and call it Where's Basil?